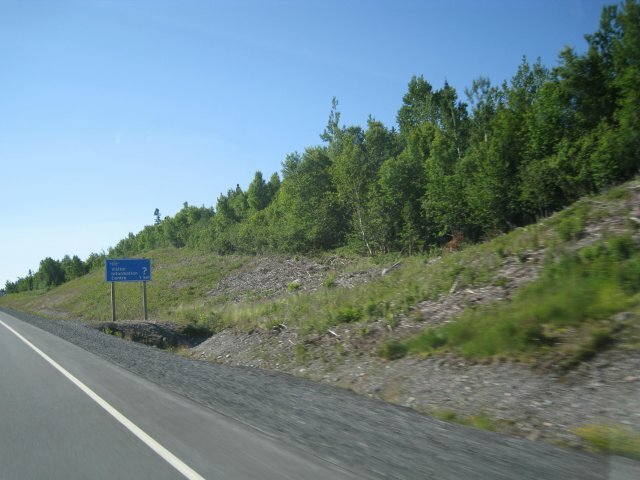 It's 158 miles from the park to St. John's via the Trans Canada Highway also known here as TCH. In most places the road is built very high, perhaps 8 feet above the ground. The ground is very marshy like tundra so it takes a lot of gravel and sand for support so the road will not heave in the winter. However, the downside is anyone going off the shoulder will just roll over into the deep ditch. The occasional cross marking the spot where someone went off is proof there is a problem. The only places we saw guard rails were when the ditch was as high as the trees. Another problem is sign placement. They had to build a platform for every sign (see photo). If there is equipment on a pole they build a wooden bridge so the maintenance people can get to the equipment. There is very little traffic overall on the TCH. I did a 20 minute survey and counted 102 vehicles going the other way; 13% were large trucks/RVs and 87% cars and small trucks. So far we have filled up with diesel 4 times. Low sulphur diesel does not appear to be available anywhere. This means people with diesel engines built after 2006 cannot tour Newfoundland at the present time or risk expensive repairs.